← Magnificient Malacca with Xing Asia! 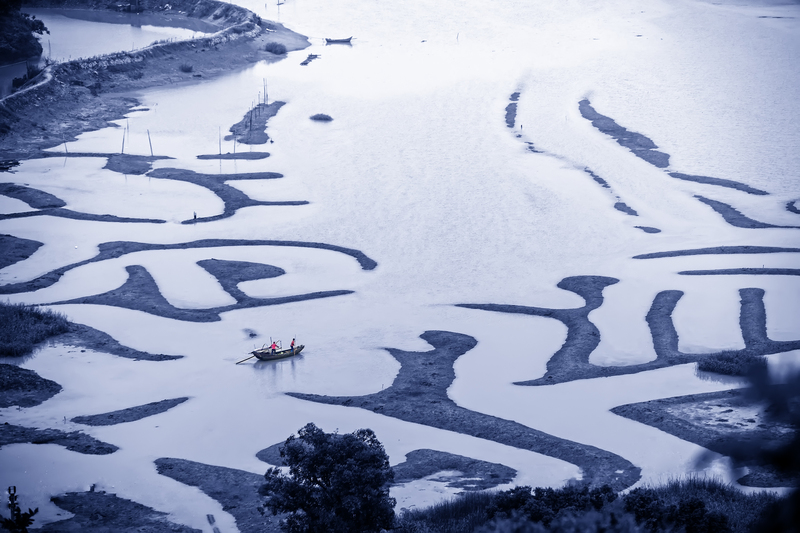 11th September 2014, Singapore – Press Release from Pentax Ricoh. Following the release of the strange-looking Pentax K-S1, Pentax Ricoh launches yet another strange-looking WG-M1. Maybe the company will start to produce a robot next. Live out your adventure with the all-new WG-M1. The latest addition to the WG series combines the features you love, including waterproof, shock-resistant and coldproof assurance plus the ability to capture class leading high-resolution images and motion activities. With the ultra-wide angle lens, users are sure to capture an array of outdoor activities from underwater adventures to daredevil outdoor fun. . Waterproof up to a depth of 32 feet and cold resistant to temperatures as low as -10°C, the WG-M1 is ideal for the adventure seeker. With the equipped Wi-Fi connection, sending still images and movies from your smartphone is made easy for uploading to your favorite social media site. With the WG-M1 you’ll be able to capture dynamic Full HD movie clips with a realistic sense of depth. 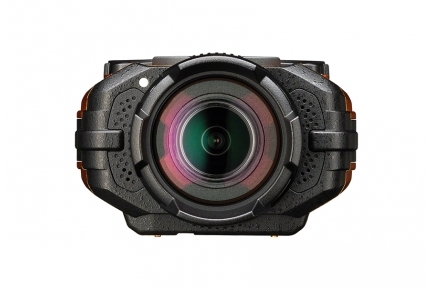 The rugged, heavy-duty design which offers large buttons and controls for ease of use, mimics that of the other WG series cameras. 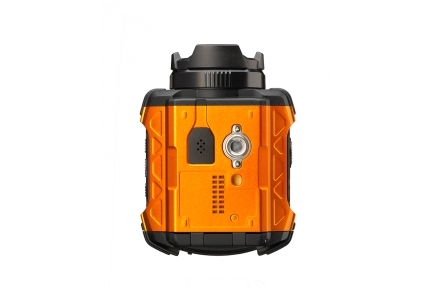 Equipped with a 1.5-inch color LCD monitor, you can easily check real-time images during both still-image and movie shooting modes. 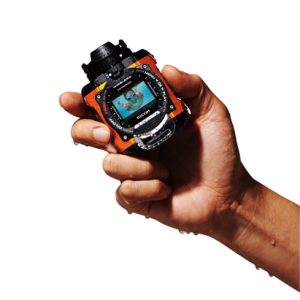 The WG-M1 is the must-have camera for the thrill seeker looking to capture the world around. By simply mounting the included underwater lens protector on the airtight body, the WG-M1 assures outstanding waterproof performance to a depth of 32’/10 m., and for up to one hour of continuous operation (equivalent to IPX8 or JIS Class 8). It is also designed to be shock-resistant against a fall from a height of 6’/2 m., *dustproof (equivalent to JIS Class 6), and cold-resistant against temperatures as low as 14°F. 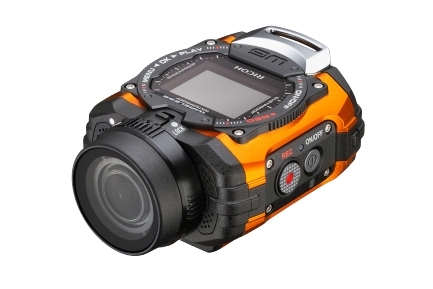 All these features make the WG-M1 a truly dependable, heavy-duty action camera in harsh, demanding outdoor conditions. Since it doesn’t require a cumbersome housing to protect the body, the user can not only enjoy underwater movies and images more freely, but also record sounds more clearly without muffling. * Measured under RICOH IMAGING-original testing standards (from a height of 6,5’/2 m., onto a surface of 2 inch-thick plywood), conforming to Method 516.5-Shock of the MIL-Standard 810F. ** When the image size of 848 x 480 pixels (at 120fps) is selected, sound cannot be recorded. Inheriting the design theme of the waterproof WG series, the WG-M1 offers a functional, heavy-duty design perfect for active outdoor shooting. It comes equipped with a 1.5-inch color LCD monitor for easy confirmation of the image composition during shooting and quick review of recorded images and movies during playback. Its large control buttons facilitate camera operations — including instant switching between still-image and movie modes — even when the user is wearing gloves. It also features a tripod socket on the bottom for the direct attachment of various accessories. The WG-M1 offers a choice of two body colors: black and orange. The WG-M1 delivers true-to-life, high-resolution still images, thanks to the combination of approximately 14.0 effective megapixels and a CMOS image sensor with outstanding high-sensitivity and low-noise characteristics and high-speed data readout. During still-image shooting, it offers a choice of four angle-of-view settings: Wide (160 degrees),* Medium,** Narrow** and Underwater. It also provides a high-speed continuous shooting mode to record a series of still images at a speed of approximately 10 images per second. * The angle of view may vary depending on the selected image size. The maximum angle of view in underwater still-image recording is approximately 97 degrees. ** The medium and narrow settings are selectable only when image size of 10M or 14M is selected. By installing a WG-M1-dedicated application in a smartphone or tablet computer, the user can perform various camera functions from a distance: confirm the status of a subject or scene, release the WG-M1’s shutter, and even check movie recordings in real time. The user can also browse and download images and movies recorded by the WG-M1 onto a smartphone or tablet computer for effortless editing using the tools provided by the application, then upload them to social networking and other websites to share them with friends. The WG-M1 provides Full HD movie recording in the H.264 recording format, capturing high-quality, extended movie clips (1920 x 1080 pixels, 16:9 proportions) at a frame rate of 30 frames per second. * Thanks to its digital shake reduction mode, the user is assured of flawless, blur-free movies, with a choice of four angle-of-view settings — Wide (approximately 137 degrees),** Medium,*** Narrow*** and Underwater. It also provides a host of creative tools to simplify complex movie-recording techniques, including “Motion detection,” which automatically starts recording a movie when the camera detects a moving object within the image field; “Loop recording,” which keeps recording movies while creating new files at five- or ten-minute intervals; “High-speed Movie,”**** which records movies specifically for slow-motion playbacks; and “Time Lapse Movie,” which produces time-compressed movies using a time-lapse recording technique. In addition, a micro-HDMI terminal (type D) is provided on the camera body for the simultaneous output of movie clips and sound to external audio-visual devices. * The maximum length of a single movie clip is 25 minutes. ** The angle of view may vary depending on the selected image size. The maximum angle of view in underwater movie recording is approximately 90 degrees. *** The medium and narrow settings are selectable only when the image size of 1920 x 1080 pixels (at 30fps) is selected. **** The image size is fixed at 848 x 480 pixels (at 120fps), while the recording duration is fixed at 60 seconds. Face Detection AF & AE function, to automatically optimize focus and set exposure on the subject’s face WG adhesive mount, to attach the camera body to different surfaces using a powerful adhesive tape Carabineer-equipped strap, to suspend the camera on a backpack or other object for easy carrying Compatible with micro SD and micro SDHC memory cards. For the Full specifications, please visit here. This entry was posted in Brand: Others (Cosina, Carl Zeiss, Leica, Mamiya, Samyang, Vivitar, Zenitar,etc), Brand: Pentax, Photography Articles & Videos, Uncategorized and tagged Camera, Pentax Ricoh, Photography, Ricoh, WG-M1. Bookmark the permalink.